If you’re missing a tooth, particularly a molar that isn’t visible to others, it can be tempting to simply leave the gap. Not only can this wreak havoc with the alignment of your teeth and your bite, but it can lead to other oral health problems as well. The best solution is to replace your missing tooth with a dental implant. Implants provide a long-lasting solution, often lasting the remainder of the patient’s life. They also function exactly like a natural tooth. When a number of teeth are missing, we can use implants to anchor partial dentures. Dr. Walk and Dr. Bamel have extensive experience placing dental implants. A dental implant is a prosthetic replacement for a missing or severely damaged tooth that needs to be extracted. The implant gets its name from its titanium base. This screw-shaped prosthetic is screwed down into the socket of the former tooth root and the jawbone grows around it, making it a part of the jaw. A post is then placed into the implant, and an artificial tooth is attached to the post. Now the patient has a fully functioning dental implant that looks and feels just like a natural tooth and can last for decades. The determining factor if an implant can be placed into the jaw is your jawbone mass and density. If you’ve been missing a tooth or a couple teeth for a period of time, that could have caused the jawbone to lose some mass in that area. If that is the case, Dr. Walk or Dr. Bamel can still place an implant, but they’ll have to build up the jaw mass with a bone graft first. Otherwise, as long as you don’t have other dental issues, such as gum disease, just about anyone is a good candidate for an implant. Why should I replace a missing tooth with an implant? Teeth remain in place due to the pressure placed upon them by the adjacent teeth. Without this pressure, they tend to move. This is what happens with a missing tooth, as the adjacent teeth slide over to fill the gap. This creates problems with your alignment and bite. Chewing and biting create a great deal of energy that flows down into the tooth. This energy is transferred through the tooth down into the jawbone, stimulating the jawbone to continually regenerate new bone mass. This is key to a healthy and strong jawbone. Without that energy coming down through the tooth, the jawbone in that area begins to deteriorate and resorb. Dental implants behave exactly like a natural tooth so that the patient can eat any foods and chew normally. Implants have a 90-95% success rate and can last for decades, giving the patient back his or her smile and the ability to eat any foods. Having a dental implant placed with the team at Cosmetic Dentistry Center isn’t a one-appointment procedure. It involves a series of steps. Consultation: The implant process begins with a consultation with Dr. Walk or Dr. Bamel, who performs a full oral exam and takes x-rays and a CT scan to determine your jawbone mass. Placement: Next the titanium implant is placed into the hole formerly occupied by the tooth root. We may have to drill a small hole into the jawbone to prepare it. 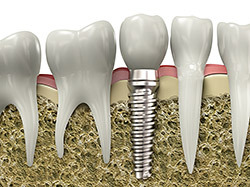 The implant is shaped like a screw and is inserted in that fashion. Osseointegration: Now the patient simply waits three to six months as the jawbone naturally grows around and accepts the titanium implant. How long this takes is unique to each patient. Placing the crown: The final step is to place a custom-made porcelain crown onto the abutment. 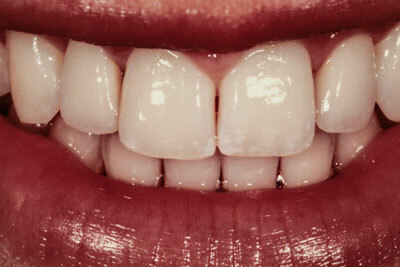 We make the crown to match the color and shape of the surrounding teeth so, once in place, it fits in naturally. Click here to view more before and after cases in our Smile Gallery. Really the only alternative to replacing a single missing tooth or two is a dental bridge. A bridge is a one-piece prosthesis that involves placing crowns on the two healthy teeth on each side of the gap, with an artificial tooth in the middle to replace the missing tooth. At Cosmetic Dentistry Center, we prefer implants to bridges for a couple reasons. First, implants can last the rest of the patient’s life while bridges only last from 5-15 years. 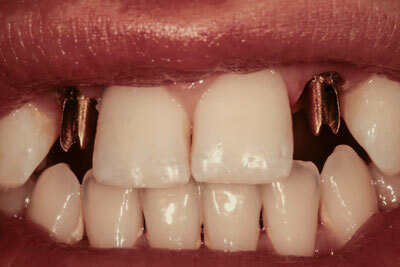 A patient will likely need to replace bridges at least once or twice. Second, implants function exactly like a natural tooth. You can eat what you want and they don’t need any special care. Implants can handle the same bite force as a natural tooth. Bridge wearers have to be cognizant of eating overly sticky or hard foods so as not to damage their bridge. Do I have to give my implant special care? Because a dental implant behaves exactly like a natural tooth, your home hygiene should remain the same. Daily brushing and flossing are all that’s needed. As with your natural teeth, the quality of your home hygiene can dictate how long your implant lasts. But in many cases, an implant can last the remainder of the patient’s life. For more information on Dental Implants, please contact our office at 617-965-7673 to schedule a consultation.